Increased adiposity is often associated with over activation of the hypothalamo-pituitary adrenal axis (HPA axis) and the sympatho-adrenal medullary system (SAM system) and excessive activation of these pathways in response to physiological challenges may be linked with the development of diseases. We tested the hypothesis that overweight/obese men aged 50–70 years will have greater HPA axis and SAM system responses to food intake compared with age matched lean men. Lean (Body Mass Index; BMI = 20-25 kg/m2; n = 19) and overweight/obese (BMI = 27-35 kg/m2; n = 17) men (50–70 years) made their own lunch using standardised ingredients at 1200 h. Concentrations of cortisol and alpha amylase were measured in saliva samples collected every 15 min from 1145 h-1400 h with the exception of during lunch (1215 h) where no sample was collected. Blood pressures and heart rate were measured at 1145 h and every 15 minutes between 1245 h and 1400 h.
Overweight/obese men had significantly higher body weight, BMI, percentage body fat and waist and hip circumferences compared to lean men (p < 0.001 for all). The meal consumed by the participants consisted of 22% protein, 53% carbohydrates and 25% fat. 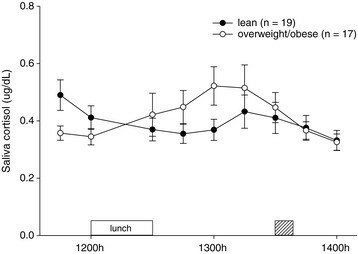 Overweight/obese men responded to lunch with a significant increase in cortisol whereas lean men did not show such an increase (time*treatment p = 0.008). There were no significant differences between the groups in the salivary alpha amylase response to the meal (time*treatment p = 0.195) or in SBP, DBP, MAP or HR responses (time*treatment p = 0.726, 0.898, 0.713, 0.620, respectively). While men with a moderate level of overweight/obesity had a significant HPA axis response (as measured by salivary cortisol) to a standardised lunch, lean men had no HPA axis response. Lean and overweight/obese men had similar increases in SAM system activity (as measured by salivary alpha amylase) in response to the meal. Exposure to stress activates the SAM system (which results in increases in salivary alpha amylase, blood pressure and heart rate) and the HPA axis (which results in increases in salivary cortisol) . Hyperactivity of these pathways can be associated with the development of numerous chronic conditions including cardiovascular disease, type 2 diabetes, anxiety and depression . Obesity is a worldwide epidemic and is associated with numerous health complications and increased morbidity . Animal studies by our research group as well as others suggest that obesity can be associated with increased HPA axis and SAM system responses to stress ,. Evidence from human studies is not conclusive in this regard. Some studies have suggested hyperactivity of the stress pathways in obesity in response to various stressors such as postural challenges, video game challenges, exposure to cold, mental arithmetic challenges and pharmacological stimulation –. Others have suggested that there is no association between increased adiposity and stress pathway activation or that increased adiposity is associated with lower stress pathway activation to similar stressors –. Food intake is a physiological challenge that can activate the HPA axis –. Gibson and colleagues reported that a high protein (32% of energy in protein) mid-day meal can elicit greater (1.5 -2 fold increase) HPA axis responses compared with a low protein (5% of energy in protein) mid-day meal in young healthy females . They also showed that a high protein meal (39% energy in protein) can elicit a significant HPA axis response in young men . Nevertheless, Martens and colleagues measured cortisol responses in men to three different types of shakes (high protein shake, high carbohydrate shake and high fat shake) and reported that only the high carbohydrate shake resulted in an increase in cortisol secretion . Each of the shakes used contained 2306 ± 77 kJ. Furthermore, Vicennati and colleagues reported that only high carbohydrate meals (89% carbohydrate, 11% protein, 0% fat) but not high protein/fat meals (53% lipids, 43% protein and 4% carbohydrate) resulted in a significant HPA axis response in women who predominantly had a visceral body fat distribution compared with women with peripheral body fat distribution and normal weight healthy controls . Therefore, it appears that the evidence in humans in this area is inconclusive. None of the past studies in this area have considered the activation of the SAM system responsiveness to ingestion of food. Thus, there is a paucity of evidence on SAM system reactivity to consumption of food. Furthermore, no previous studies have investigated the effects of adiposity on HPA axis and SAM system activity in lean and overweight/obese men in response to food intake. Since food intake is a challenge experienced by the human body several times per day, a greater understanding of the influence of adiposity on the physiological response to food intake is of fundamental importance. If overweight/obese men have a greater activation of the stress pathways every time they consume food it is plausible that they may be more susceptible to the development of stress-related diseases. Research shows that, during challenges, activation of the SAM system increases the secretion of alpha amylase by the salivary glands –. Simple sampling procedures of saliva makes salivary alpha amylase a useful non-invasive measure of SAM system activity . Further advantages of salivary alpha amylase include its concentration being independent of the salivary flow rate . Activation of the HPA axis by stress results in the sequential secretion of corticotrophin releasing hormone (CRH) and arginine vasopressin (AVP) from the hypothalamus, adrenocorticotrophic hormone (ACTH) from the anterior pituitary gland and glucocorticoids such as cortisol from the adrenal cortex ,. Changes in the above parameters are used as markers of the activity of these stress pathways. The aim of this investigation was to identify differences between lean and overweight/obese men in HPA axis responses (measured via salivary cortisol) and SAM system responses (measured via salivary alpha amylase) to the consumption of a standardised lunch. It was hypothesised that overweight/obese men will have greater salivary cortisol and salivary alpha amylase responses to the standardised lunch compared with lean men. Men aged 50–70 years were recruited using newspaper and online advertisements, fliers in community centres and Medical Clinics, mail outs to participants of previous studies and by fliers dropped in mail boxes. Exclusion criteria were prior diagnosis with Cushing’s syndrome, any stress or anxiety disorder, depression, diseases of the adrenal gland, type 2 diabetes, heart disease (including use of a pacemaker), high cholesterol, stroke, cancer or use of blood pressure or diabetes medication. Men were also excluded if their BMI fell outside of the required ranges (20–25 kg/m2 for lean and 27–35 kg/m2 for overweight/obese), if their resting blood pressure exceeded 160 mmHg for systolic blood pressure or 90 mmHg for diastolic blood pressure. Written informed consent was provided by all men prior to participation in the study. All procedures were approved by the Human Research Ethics Committee of Deakin University (Project code: EC00213) and conformed to the guidelines of the National Health and Medical Research Council’s National Statement on Ethical Conduct in Human Research (2007). Participants were asked to abstain from smoking, ingesting any caffeine containing beverages (e.g. tea, coffee, cola), liquorice, alcohol or drugs (except for any regular medications) and from strenuous physical activity during the 12 hours prior to participation in the study. They were asked to arrive at the laboratory at 1100 h and they were given a standardised lunch at 1200 h. The first saliva sample was collected at 1145 h, the second one at 1200 h (immediately before lunch), third at 1230 h and subsequent samples were collected every 15 minutes until 1400 h. Systolic blood pressure (SBP), diastolic blood pressure (DBP), mean arterial pressure (MAP) and heart rate (HR) were measured using a clinical blood pressure monitor (Criticare systems Inc, Wisconsin, USA) at 1145 h, 1245 h and every 15 minutes from there onwards until 1400 h. Participants were allowed a break to use the bathroom immediately after the 1330 h saliva and blood pressure/heart rate sampling. Participant’s height (Measurement Concepts, North Bend, Australia), body weight (TANITA, Wedderburn, Melbourne, Australia) and percentage body fat using bio electrical impedance (TANITA, Wedderburn, Melbourne, Australia) were measured at the start of the experimental day. Body mass index (BMI) was calculated using the equation BMI = body mass (kg)/height (m)2. Waist circumference was measured at the midpoint between the last rib and the anterior superior iliac spine using a tape measure and hip circumference was measured at the widest point of the gluteal area . Waist to hip ratio was calculated by dividing waist circumference by hip circumference. The test meal consisted of lunch made by the participants from a choice of standardised ingredients including bread, margarine, processed meat (ham or chicken), tomato, cucumber, cheese, nuts, fruit bars and a fruit drink (juice box). Water was available ad libitum. Records were collected of foods and quantities consumed in household measures. Foods consumed were entered into and analysed using FoodWorks software (Xyris, Queensland, Australia). Salivette sampling tubes (Sarstedt, Ingle Farm, Australia) were used for sample collection. These tubes consist of a centrifugation tube and a cotton swab. Participants were instructed to hold the cotton swab in their mouth for 2 minutes. They were asked to put the cotton swab under their tongue for the first 30–45 seconds and to move it around the oral cavity for the remainder of the duration without chewing it or holding it between their teeth. Temporary storage of samples on ice occurred immediately after collection and samples were centrifuged at 2000 rpm for 5 minutes at 4°C after the testing period. Resultant saliva was stored at −80°C until assayed. Since the measurement of saliva cortisol has been shown to be unaffected by blood contamination due to micro-injury of the oral cavity , we did not perform haemoglobin assays in saliva to check for blood contamination. This approach is in accordance with previous research , that has considered salivary cortisol concentrations in response to food intake. Saliva concentrations of cortisol were measured using an enzyme immunoassay (Diagnostic Systems Laboratories, TX, USA). All samples from a single participant were assayed within the same assay. Thirty-one assays were conducted with a mean sensitivity of 0.035 μg/dL. The intra-assay coefficient of variation was 6.9% at 0.25 μg/dL and 8.2% at 2.0 μg/dL. The inter-assay coefficient of variation was 9.4% at 0.28 μg/dL and 7.7% at 1.8 μg/dL. Saliva concentrations of alpha amylase were measured using a kinetic assay kit (Salimetrics, PA, USA). All samples from a single participant were assayed within the same assay. Thirty-six assays were conducted with a mean sensitivity of 0.4 U/ml. The intra-assay coefficient of variation was 7.4% at 156.3 ± 4.1 U/ml. The inter-assay coefficient of variation was 7.4% at 20.7 U/ml and 7.0% at 257.3 U/ml. Pre- treatment salivary cortisol and pre-treatment salivary alpha amylase were defined as the concentrations of the hormones in the samples collected at 1200 h. Pre- treatment SBP, DBP, MAP and HR were defined as the value recorded at 1145 h. Peak height for cortisol was defined as the highest value obtained for each individual between 1230 h- 1400 h, inclusive. Since the SAM system appears to have had a secondary activation at the time of the break to use the bathroom, peak height for salivary alpha amylase was defined as the highest value obtained from 1230 h-1330 h. Peak height for all cardiovascular parameters was defined as the highest value obtained between 1245 h-1330 h. Reactivity was calculated by subtracting the pre-treatment value from the peak height for all parameters. Area under the curve (AUC) with respect to increase was calculated for cortisol using values between 1200 h – 1400 h, for salivary alpha amylase using values between 1200 h – 1330 h and for SBP, DBP, MAP and HR using values between 1145 h – 1330 h after the subtraction of the pre-treatment value from each data point. AUC for all parameters were calculated using the trapezoid rule utilising Sigmaplot graphing software (Systat Software Inc., California, USA). Data were analysed using the Statistical Package for the Social Sciences software version 21.0 for windows (SPSS. Inc, Chicago, USA). Kolmogorov-Smirnov and Shapiro –Wilk tests were conducted to test for normality. Tests for homogeneity of variance were conducted using Levene’s test of equality of error variances. Descriptive characteristics were compared between groups using univariate analysis of variance. Salivary cortisol, salivary alpha amylase, blood pressures and heart rate were compared within and between subjects using repeated measures analysis of variance. The within subjects factor was time and the between subjects factor was treatment. When the time effect for salivary cortisol was considered separately in each group, only data from 1200 h-1400 h were included. Derived salivary cortisol, salivary alpha amylase and cardiovascular parameters (pre- treatment, peak height, reactivity and area under the curve) were compared between groups using univariate analysis of variance. P < 0.05 was considered statistically significant. Data were collected from 24 lean and 22 overweight/obese men who were eligible for the study. Two lean and 5 overweight/obese were subsequently excluded from the analyses due to insufficient saliva volume to undertake the assays for cortisol and alpha amylase. It was ascertained in initial analyses that the lean group was significantly (p = 0.054) older (64.2 ± 1.1 years) than the overweight/obese group (61.1 ± 1.1 years). To remove this effect (to ensure that men were age matched by group), the results of the three oldest lean men were excluded from the final analyses. Consequently, 19 lean and 17 overweight/obese were included in the final study cohort. The men that were excluded did not differ significantly from the final cohort in any of the baseline characteristics. Overweight/obese men had significantly higher body weight, BMI, percentage body fat and significantly lower percentage lean mass compared with lean men (p <0.001 for all) (Table 1). Girth measurements were also higher in overweight/obese men with a 19% larger waist circumference (p < 0.001), a 10% larger hip circumference (p < 0.001) and a 10% larger waist-to-hip ratio (p < 0.001) compared with lean men. BMI body mass index, % Fat percentage body fat, % Lean percentage lean mass, WHR waist to hip ratio. Lean and overweight/obese men consumed similar amounts of total energy, protein, carbohydrate and fat (Table 2). There were no significant differences between the groups in these parameters. Overall (both groups combined), the meal consumed by the participants consisted of 22% protein, 53% carbohydrates and 25% fat. Saliva concentrations of cortisol in lean and overweight/obese men are shown in Figure 1 and Table 3. In response to lunch, saliva concentrations of cortisol differed significantly between lean and overweight/obese men (time*treatment, p = 0.008; Figure 1). Further, separate analysis of the groups revealed a significant effect of time in overweight/obese men (p = 0.005) but not in lean men (p = 0.384). The peak height of cortisol concentrations in the overweight/obese group (0.654 ± 0.09 μg/dL) was significantly higher than pre-treatment concentrations (0.345 ± 0.03 μg/dL) (p = 0.003). This corresponded to an 86% increase in cortisol concentrations from pre-treatment concentrations to the peak height of the response in overweight/obese men. There were no significant differences between the groups in peak height for the cortisol response (Table 3). Area under the curve for cortisol was significantly higher in the overweight/obese men compared with lean men (p = 0.039) and there was a trend towards cortisol reactivity being higher in overweight/obese men compared with lean men (p = 0.083; Table 3). Repeated measures analysis of variance revealed that there was a significant overall effect of time (p < 0.001; Figure 1). There was no significant between subjects effect indicating that there were no significant overall differences between the groups (p = 0.643). Mean (±SEM) concentrations of salivary cortisol (μg/dL) in lean and overweight/obese men from 1145 h to 1400 h (time effect p < 0.001; time*treatment interaction p = 0.008; treatment effect p = 0.643). The box labelled “lunch” represents the timing of the lunch period and the hashed box represents the timing of the break to use the bathroom. * Univariate analysis of variance. AUC Area under the curve. Saliva concentrations of alpha amylase in lean and overweight/obese men are shown in Figure 2 and Table 4. Repeated measures analysis of variance revealed that there was a significant effect of time (p < 0.001; Figure 2). Overall (both groups combined), the peak height of salivary alpha amylase concentrations (235 ± 24.6 μg/dL) was significantly higher than pre-treatment concentrations (131 ± 12.8 μg/dL) (p < 0.001). Overall, there was an 80% increase in salivary alpha amylase concentrations from pre-treatment concentrations to the peak of the response (both groups combined). Mean (±SEM) concentrations of salivary alpha amylase (U/ml) in lean and overweight/obese men from 1145 h to 1400 h (time effect p < 0.001; time*treatment interaction p = 0.195; treatment effect p = 0.898). The box labelled “lunch” represents the timing of the lunch period and the hashed box represents the timing of the break to use the bathroom. Saliva concentrations of alpha amylase in response to the lunch did not differ significantly between lean and overweight/obese men (time*treatment, p = 0.195; Figure 2) and accordingly, there were no significant differences between the groups in peak height, reactivity or area under the curve for the salivary alpha amylase response (Table 4). There was no significant between subjects effect (p = 0.898) indicating that there were no significant overall differences between the groups. Cardiovascular parameters in lean and overweight/obese men are shown in Figure 3 and Table 5. Mean (±SEM) a) systolic blood pressure (mmHg), b) diastolic blood pressure (mmHg), c) mean arterial pressure (mmHg) and d) heart rate (bpm) in lean and overweight/obese men from 1145 h to 1400 h (time effect p = 0.001, 0.000, 0.007, 0.087, respectively; time*treatment interaction p = 0.726, 0.898, 0.713, 0.620, respectively; treatment effect p = 0.058, 0.022, 0.026, 0.709, respectively). The boxes labelled “lunch” represent the timing of the lunch period and the hashed boxes represent the timing of the break to use the bathroom. SBP Systolic blood pressure, DBP Diastolic blood pressure, MAP Mean arterial pressure, HR Heart rate, AUC Area under the curve. There was a significant effect of time for systolic blood pressure (p = 0.001; Figure 3a). Overall (both groups combined), the peak height of systolic blood pressure (129 ± 3 mmHg) was significantly higher than pre-treatment systolic blood pressure (124 ± 3 mmHg) (p = 0.03). Systolic blood pressure in response to the lunch did not differ significantly between lean and overweight/obese men (time*treatment, p = 0.726; Figure 3a). Systolic blood pressure reactivity and area under the curve did not differ between the two groups (Table 5). However, overweight/obese men had significantly higher pre-treatment and peak height values for systolic blood pressure compared with the lean men (p < 0.05 for both; Table 5). There was also a trend towards systolic blood pressure being significantly higher overall in the overweight/obese men compared with the lean men (between subjects effect, p = 0.058). Repeated measures analysis of variance revealed that there was a significant effect of time for diastolic blood pressure (p < 0.001; Figure 3b). Overall (both groups combined), the peak height of diastolic blood pressure (74 ± 2 mmHg) was significantly higher than pre-treatment diastolic blood pressure (71 ± 2 mmHg) (p = 0.03). Diastolic blood pressure in response to the lunch did not differ significantly between lean and overweight/obese men (time*treatment, p = 0.898; Figure 3b). This finding was consistent with a lack of significant difference in reactivity and area under the curve of diastolic blood pressure between lean and overweight/obese men (Table 5). Nevertheless, overweight/obese men had a significantly higher pre-treatment diastolic blood pressure and peak height compared with the lean men (Table 5). There was a significant between subjects effect indicating that the overweight/obese men had higher diastolic blood pressure overall than the lean men (p = 0.022). There was a significant effect of time for mean arterial pressure (p = 0.007; Figure 3c). Overall (both groups combined), there was a trend towards the peak height of mean arterial pressure (92 ± 2 mmHg) being significantly higher than pre-treatment (89 ± 2 mmHg) (p = 0.06). 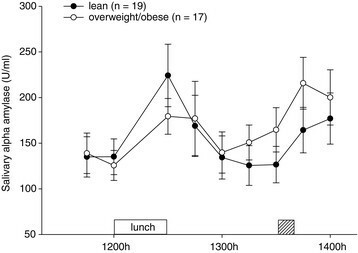 Mean arterial pressure in response to the lunch did not differ significantly between lean and overweight/obese men (time*treatment, p = 0.713; Figure 3c). Mean arterial pressure reactivity and area under the curve were similar in overweight/obese men compared with lean men (Table 5). Overweight/obese men had a significantly higher pre-treatment and peak height for mean arterial pressure compared with lean men (Table 5). There was also a significant between subjects effect indicating that the overweight/obese men had higher mean arterial pressure overall compared with lean men (p = 0.026). There was no significant effect of time for heart rate (p = 0.087; Figure 3d). Overall (both groups combined), the peak height of heart rate (68 ± 3 bpm) was not significantly different to pre-treatment heart rate (64 ± 3 bpm) (p = 0.16). Heart rate following lunch did not differ significantly between lean and overweight/obese men (time*treatment, p = 0.620; Figure 3d) and accordingly, there were no significant differences between the groups in peak height, heart rate reactivity or area under the curve for heart rate (Table 5). There were also no significant differences between the groups in pre-treatment heart rate (Table 5) and there was no significant overall between subjects effect indicating that there were no significant overall differences between the groups for heart rate (p = 0.709). Our hypothesis that overweight/obese men will have greater cortisol and alpha amylase responses to the challenge of food consumption compared with lean men was partially supported. Overweight/obese men showed a greater activation of the HPA axis to food intake compared with lean men as indicated by the higher response of salivary cortisol. Contrary to our hypothesis, both groups showed a similar salivary alpha amylase response to consumption of food. Systolic blood pressure, diastolic blood pressure, mean arterial pressure and heart rate responses were also similar between the groups in response to lunch indicating that there is no difference in SAM system activation in response to food intake between lean and overweight/obese men. The finding that only overweight/obese men showed a significant HPA axis response to food intake is of particular importance. This is in accord with the findings of Vicennati and colleagues in women with abdominally distributed body fat (waist to hip ratio > 0.85) in response to the ingestion of a high carbohydrate meal . Nevertheless, it should be noted that the meal used by Vicennati et al. contained 89% carbohydrates whereas ours only contained 53% carbohydrates. This suggests that even moderate levels of carbohydrates can elicit a significant HPA axis response in overweight/obese men. The notion that even moderate levels of carbohydrates can elicit significant HPA axis activity is of particular significance, especially in the context of the modern day western diets including large quantities of refined carbohydrates . This could even be more relevant to individuals who are already overweight/obese and are on a high carbohydrate diet because regular elevations of cortisol may further complicate metabolic anomalies that may already exist. Findings by Martens et al. further reiterate the importance of the carbohydrate content in eliciting cortisol responses to food intake . They reported that protein or fat intake can decrease cortisol responses, whereas ingestion of carbohydrates increased cortisol responses. Therefore, it appears that the carbohydrate content of a meal can play a significant role in activating the HPA axis. Lean men did not show a significant elevation in cortisol after consumption of the standardised lunch in the current experiment. This is contrary to the findings of Gibson and colleagues in 1999 where they investigated cortisol responses to a high protein (39%) lunch in healthy men . It should be noted that the contribution of protein towards the total energy in the current experiment was only 22%. Therefore, it appears that a protein content as low as 22% can elicit significant HPA axis response in overweight/obese men. This also suggests that a significant HPA axis response is dependent on a higher protein content only in lean men. The energy intake in the current study is also similar to that of the average Australian energy intake for men (22% protein, 45% carbohydrate and 32% fat) as reported in the 1995 National Nutrition Survey . Therefore, it is highly likely that overweight/obese men will consume a diet that can elicit a significant cortisol response every time they eat. Abdominal obesity can be associated with disrupted endocrine as well as neural feedback from the brain-gut axis to the HPA axis . Food can stimulate the secretion of certain peptides/hormones such as insulin, leptin, ghrelin, cholecystokinin, and pancreatic peptide Y which can in turn have an impact on the HPA axis activity ,. It has been reported that these feedback pathways are malfunctioning in obese individuals . Overweight/obese men in the current study had significantly higher waist to hip ratios compared with the lean men suggesting that they had a higher proportion of abdominally distributed fat. Therefore, it is possible that abdominally based body fat distribution in the overweight/obese men may have contributed towards the higher HPA axis response to the lunch. There are several mechanisms that may play a role in overweight/obese individuals having a higher cortisol response to food intake. For example, differences in stimulation of the HPA axis compared with lean individuals, perhaps through increased noradrenergic drive, decreased negative feedback and/or increased corticotrophin releasing hormone and arginine vasopressin synthesis and secretion are plausible mechanisms for the pattern of results observed . Cortisol plays a major role in metabolism  and it is well known that variations in cortisol can have a significant impact on nutrient absorption ,. Cortisol contributes towards lipolysis and proteolysis thus it increases the plasma free fatty acid availability. This could potentially accentuate the deposition of abdominal fat or further complicate existing manifestations of obesity. Furthermore, hyperactivity of the HPA axis has been shown to be associated with cardiovascular disease , type 2 diabetes  and anxiety and depression . None of the previous studies in this area has investigated the effects of food consumption on the activity of the SAM system in lean and overweight/obese men. Our results indicate that, with the exception of heart rate, all of the SAM system parameters that were measured in the current experiment (salivary alpha amylase, systolic blood pressure, diastolic blood pressure and mean arterial pressure) increased in response to lunch (time effect for all parameters p <0.05). These findings partially concur with the reports of Harthoorn et al. who found increases in sympathetic nervous system activity after ingestion of a standardised meal (15-20% protein, 35-40% fat and 40-45% carbohydrate) in a group of healthy men and women . Increases in sympathetic nervous system activity are to be expected as eating places a demand on the cardiovascular system. It has been reported that the postprandial increase in heart rate together with the subsequent increase in cardiac output facilitates the rise in demand for blood flow to the visceral areas . However, there was no such effect on heart rate in the current experiment. The reduction in systolic blood pressure, diastolic blood pressure and mean arterial pressure in the postprandial period (i.e., 1245 h-1330 h in the current experiment) may be a result of the reduction in resistance to blood flow in the mesenteric vessels. Another plausible explanation could be that the satiety hormones are having an inhibitory effect on the sympathetic nervous system during this period ,. These findings suggest that there is no differential SAM system response to food intake in men based on the level of adiposity. It has previously been reported that sympathetic nervous system response to food intake can be bi-phasic in nature . Harthoorn et al. reported a secondary increase in sympathetic nervous system activity about 45–50 minutes post ingestion of a meal. This could be attributed to the physiological changes that happen due to the gastrointestinal mechanisms of digestion of food. While this previously reported increase is somewhat similar to the secondary rise in salivary alpha amylase and blood pressure parameters in the current experiment, the increase in the current experiment occurred with a greater delay (75–90 minutes) after the ingestion of the meal. The secondary increase in our experiment coincided with the bathroom break that was offered to participants after the 1330 h sample collection. Consequently, it is not possible to determine in the current experiment if this secondary increase in SAM system activity is a result of gastrointestinal mechanisms of food ingestion or merely an artefact of the participants physically moving during the bathroom break. The current experiment is the first of its kind to investigate both SAM system and HPA axis responses simultaneously in response to food intake. While the measurement of saliva cortisol (which is in a high concentration per volume range; ug/dl range) has been shown to be unaffected by blood contamination due to micro-injury of the oral cavity , blood contamination has been shown to influence the measurement of steroid hormones present in the very low concentration per volume range (pg/ml range) including salivary testosterone , salivary oestradiol  and salivary progesterone . Therefore, to support the outcomes of the current study, future research could confirm these findings in a similarly designed study that measures plasma cortisol instead of salivary cortisol. Future experiments could also consider females and participants of different age groups. In conclusion, this experiment showed that increased adiposity in men was associated with hyperactivity of the HPA axis after the ingestion of a meal consisting of 22% protein, 53% carbohydrates and 25% fat. This suggests that ingesting a standardised meal can result in differential HPA axis but not SAM system activation in overweight/obese men of 50–70 years compared with age matched lean men. The authors thank John Reynolds for advice about statistical and power analyses, Emma Townsin, Sara Drew and Maryam Delavari for technical support and all of the participants for being involved in this research. This research was funded by Deakin University. The authors declare that they have no competing interests. SUJ, AIT and SJT designed the experiment, managed recruitment and undertook data collection. Bio chemical and cardiovascular analyses were conducted by SUJ under the guidance of AIT, SJT and CAN. AJT made substantial contributions to the analysis and interpretation of data. All authors made substantial contributions in revising the manuscript and approval of the final version.